Those changes include the complete removal of the 2D Toolkit from the game and make the game 100% based on Unity's 2D support. And while 2D Toolkit is not a bad plugin for Unity, I think it has served it's prupose for me by now. I started using Unity back in November 2013, when there was no 2D support at all from Unity's sid, and the 2D toolkit was the only way to implement 2D graphics. When Unity started to implement 2D graphics, the wireframes of the sprites were all over the place, making games unneccisary slow (and most certainly on older Android devices). But Unity has come a long way since then and it's 2D implementation has improved a lot! The image above shows the 2 different ways of coding (left Unity's 2D and right 2D Toolkit). As you can see, 2D Toolkit still has a better wireframe than Unity's 2D implementation (1 wire against 5 in Unity's 2D), but Unity's 2D implementation has a lot of other plusses that I can't seem to get to work with 2D Toolkit (and that's not to bad-mouth 2D Toolkit - I still think it's an awesome plugin!). The most important reason to switch to Unity's 2D is the new UI system that has been implemented with version 4.6. This UI system is awesome (on the right side of the Unity image and it has a minimum wireframe) and so far I haven't been able to use it effectively with 2D Toolkit (trust me, I tried it with TetraGems' main game routine). An other BIG PLUS for Unity's 2D is that when I change the resolution of the game when it's running (or rather rotate my Android phone and thus go from landscape to portrait or vice-versa), the resolution stays the same, while in 2D Toolkit changes to the new situation. 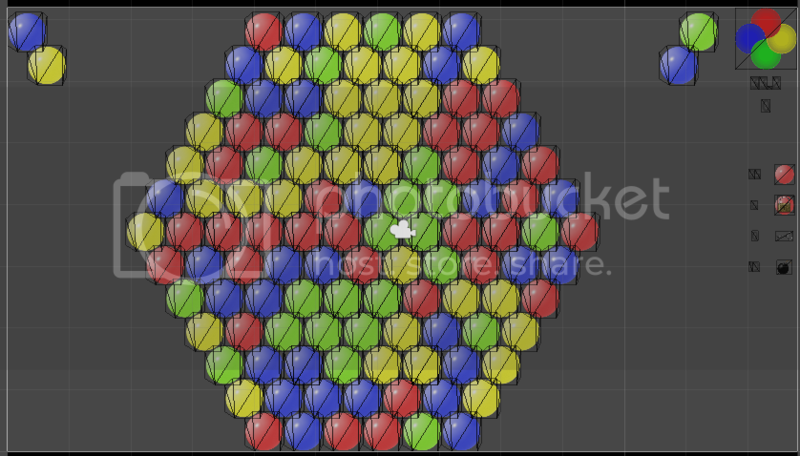 Sadly though, with this transition of 2D engine, I do have to re-code a lot of things in Burst-a-Bubble. 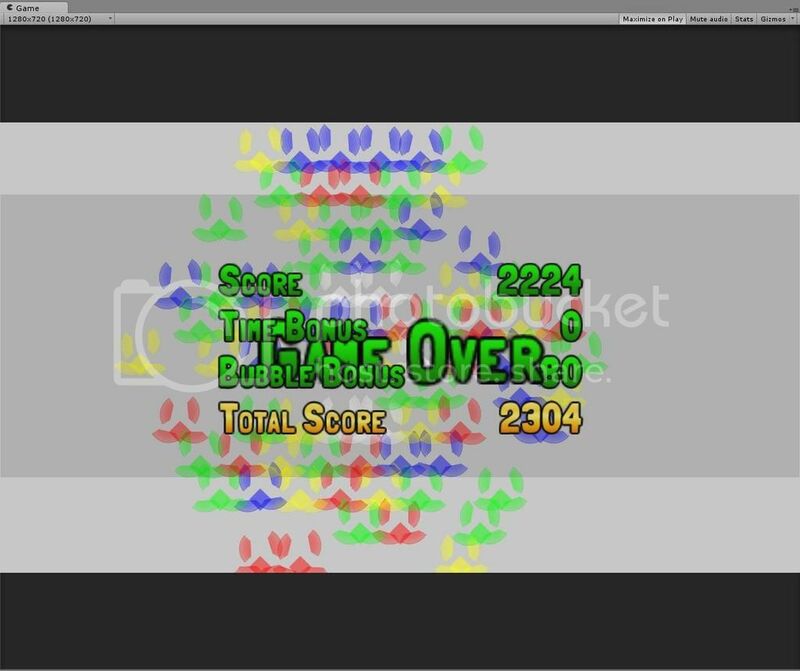 For starters, where in 2D Toolkit I can use sprite collections and just say that I want sprite number <X>, in Unity 2D I need to move all sprites to the resources and each change of sprite has to be loaded from that location. Also, where in 2D Toolkit I could just drop a sprite(collection) to the (outside of the visible) screen and instantiate things from there to the game, in Unity's 2D I need to create actual prefabs of these things and instantiate them from there to the screen, and with 7 colors of Bubbles in the game that means 7 pre-fabs against 1 sprite(collection) on the screen with 2D Toolkit. Last but not least, where 2D Toolkit has a 2D implementation of a TEXT MESH, Unity's 2D does not have such a thing. I tried to use a 3D Text mesh, but sadly those appear BEHIND the 2D sprites and thus are useless. The only way to implement 2D text iin Unity's 2D is by using the new UI ystem. While busy with the re-coding of TetraGems I had an idea for a new game. This game would include some of the basics of Burst-a-Bubble along with the gems from TetraGems. 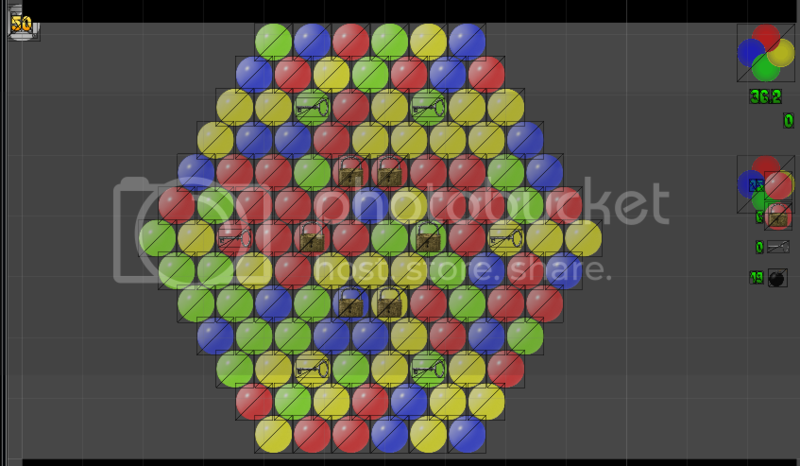 Thinking this new idea over I figured 'Why not use the Bubbles instead of Gems?'. After all, the graphics for them has been made already. This means that the initial idea of Burst-a-Bubble will be trashed. This idea, though at the basics seemed viable for a fun game, my implementation was not. The new idea will make the game more fun AND challenging to play. What the revised version of Burst-a-Bubble will look like..? That's one thing I won't spoil yet... But I can assure you that the old way I've made the game will get quite an overhaul but yet will keep a lot of the original gameplay as I wanted to include it (meaning the chains, locks and keys), while new game features will be added. Also, the new way I want to make Burst-a-Bubble will also be a way that it'll be fun to play on the PC. Okay, it was not one month on-hold, but a bit longer. The d20 project is coming along fine, but I had to take a full break to coding for 2 weeks. With the d20 project being extremely big, I decided to head back to Burst-a-Bubble again. Though I haven't started on coding today, with the solution to the animation problem, I have been working on the animations a bit more to get them right (some were for old game mechanics which have changed along the way). When these animations are working as the game does, I'll head back to level design and making art for the menus and backgrounds. I will not yet set a release date, but I will make an initial release for Android (you should have at least a 7" display or it's really small and almost unplayable) with the first 10-20 levels. After the Android release I will add new levels till I think there are enough to keep you busy for hours to come. When the Android version is running as I want (and with enough levels), I will add more animations for a Windows release , which will be released later this year. 1. Personally I think Burst-a-Bubble will be a fun game, but not really worth to sell for the Windows platform. To get accomplish that there has to be added a lot of extra features, of which I have no clue which ones I need to add (totally empty on that topic). A release for Android as Free2Play with ads on the other hand is not a viable option either, because of the work I've put into it and I think the game is worth to buy for a couple of Euros. With that, for Android the game requires a larger screen than the average phone (6" minimum because on my Moto G 4G with 5" it's barely playable) and thus it'll most likely fall into the tablet category. 2. This reason is probably more important than the previous one. I'm working on coding the d20 (v3.5 System Reference Document actually) RPG system for Unity and with that the dream to make a RPG will come closer. But before I'm ready to make a RPG from it, I do have to finish the d20 coding, which takes a lot of time. I'm doing well on it and am almost ready to make a character without equipment and skills that do not take effect yet. Early this month I've said I'd be overhauling the graphics for the Bubbles project and you have already seen a sneak preview of the new graphics last week in the movie I made. And I have been busy since that as well. Now it's time to show the new key and padlock (of which I said they sucked in the movie ) and I am somewhat proud of how they're looking! 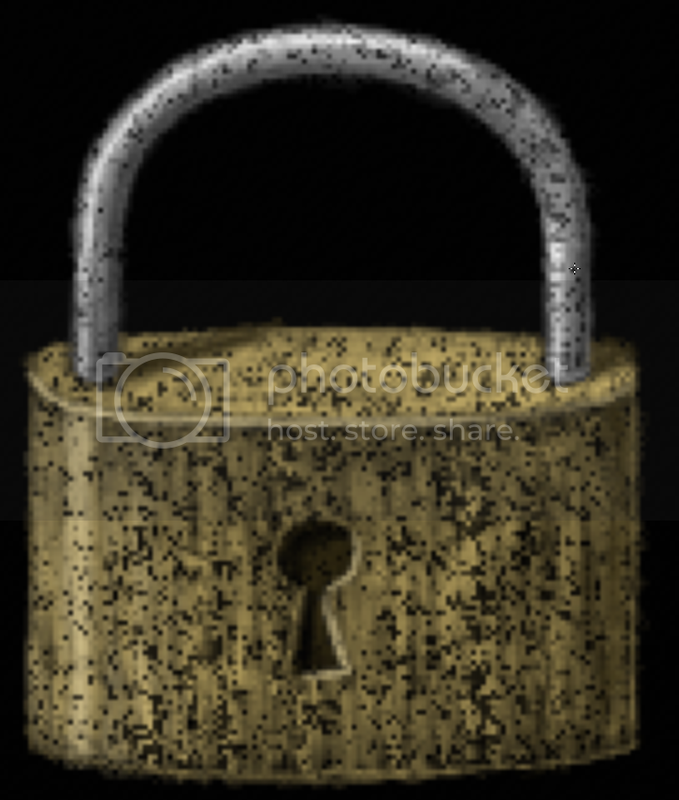 I think I need to add some extra color to the padlock itself to remove the overly huge number of black corrosion dots, but in general this is what the two are going to be like in the game. 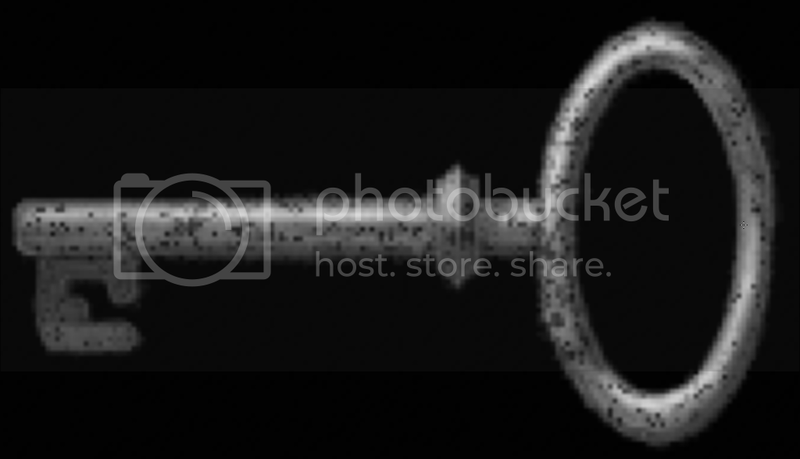 Of course, not at this size - they will be reduced a 'little' to 128x128 (little - LOL), so I'll do that first before I add the extra color to the padlock. I know I should be ashamed of myself, but after a long time I finally have been able to make that sneak preview movie of the Bubbles project And if you watch (and listen) closely you can tell I indeed was still pretty tired from the last couple of weeks. But a promise is a promise and thus I decided to make the sneak preview yesterday. Dragging the bomb to the lowered Bubbles indeed was a bug. I just can't figure out why I didn't take that into account at all in the code. Added it and the bombs are working perfectly now! The first one to be made is the volume options button. Below is the conceptual icon of it's static appearance. Of course, this one will be animated as well. 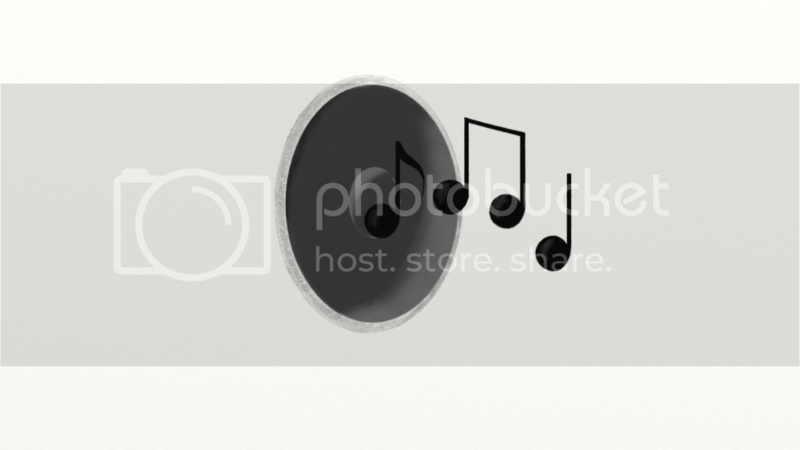 I'm thinking to let the speaker itself show some bass being played and the notes displayed will come in from the centre and flow out for a couple of seconds before they fade out again (Spriter Pro can easily handle that).